LOCKLINEAfter his return from the bush ex-rebel Opono struggles to re-adapt to society. A child soldier grows up to be an adult war commander. After sixteen years he returns home, where he starts a new fight, this time for acceptance. This is the story of one man in Gulu, Uganda, but it stands for the harsh reality of so many returning soldiers worldwide. Opono Opondo (27) has a secret. He grew up to become a war commander in the Lord’s Resistance Army (LRA) of Joseph Kony. After returning to his home town Opono is faced with another challenge - adapting to civilian life amidst the people he fought against. Sixteen years after his abduction Opono must now fight for acceptance back home. Opono cannot escape from reality. Early 2015 top LRA commander Dominic Ongwen, who was also abducted as a child, was captured and brought to the International Criminal Court in The Hague. Through the trial of his friend, questions of accountability and responsibility start to dominate Opono’s thoughts. What will your support enable us to do? We've so far been covering the majority of the costs ourselves. But in order to finish story in a professional way your support is crucial. - return to Uganda with our team to film a crucial scene late 2015. Opono considers to return fighting in the bush by joining the Ugandan army and take up his arms against his former comrades. We want to follow him while he makes his decision. - film once more in early 2016 when an important hearing will take place in the trial against former LRA top commander Dominic Ongwen. With your support we can follow this historic trial and document the reactions to the outcome in Northern Uganda. - finance the editor, the sound designer and the colorist to mold 100 hours of footage into a gripping story and to finish it according to the highest professional standards. This documentary started in 2011. Ariadne had just finished a research in Northern Uganda, a region that is recovering from two decades of war between the government and the rebelgroup LRA of Joseph Kony. Struck by the blurred lines between victims and perpetrators she drew filmmaker and good friend Maartje on board. During their research they spoke with many former LRA combatants. "When we met Opono, he immediately showed us that he is a survivor. Brave enough to break the silence about the grim reality of so many ex-rebel soldiers who encounter difficulties when trying to break the mold after their return to civilian society. To break the silence about his anxiety of being judged by his neighbors, whom he has been fighting all his life. And Opono is determined to succeed, helped by his witty sense of humor. Time and time again, he challenges our assumptions about the lives of these returning rebel soldiers: their story doesn't end with coming home, but a new struggle starts all over again. That is exactly why this story has to get into the world!" 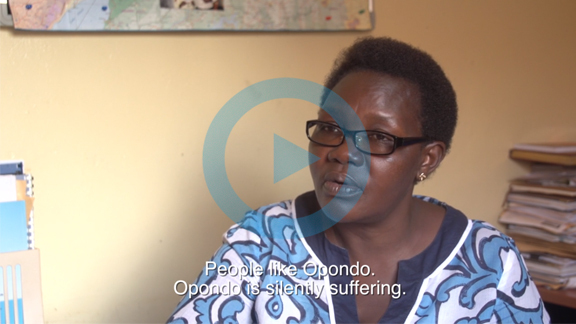 Opono’s story reminds us that peace doesn’t come with a peace agreement or ceasefire. 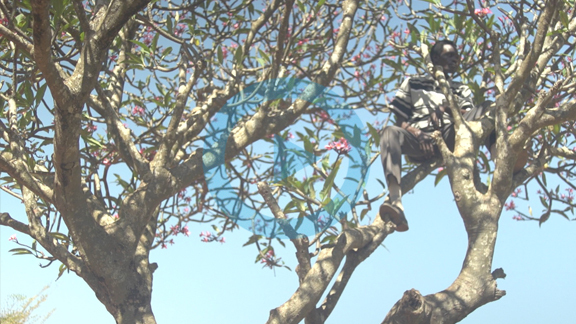 The film highlights an underexposed challenge of many post conflict societies: the rehabilitation of those who fought. In a conflict we prefer to draw a clear line between victims and perpetrators so we can hold those who are responsible accountable. The reality however is more often than not, much more complex. No place for a Rebel explores what it is to be a survivor in such a reality. Opono is brave to break the silence on the grim reality of so many ex-rebel soldiers who encounter difficulties when trying to break the mold after their return to civilian society. This film shows that their story doesn't end with coming home. In this film we ask the question how we, as humans and as society as a whole, can equip ourselves to acknowledge and give space to to the complex reality of victim-perpetrators. The problematic reintegration of former rebels can jeopardize the fragile peace in the region. Yet psycho-social and socio-economic support is declining because, as many say, 'the crisis is over.' With the ICC trial against Dominic Ongwen in The Hague about to begin, questions about responsibility and justice cause unrest among former LRA combatants. The film will be used in collaboration with our partners such as human rights film festivals and lobby groups to get this underexposed topic on the agenda both in Uganda and in the international community, and to contribute to a discussion about sustainable peace. Opono’s story revolves around the universal theme of living in a community in which one does not feel at home, or welcome. The film evokes thought on how to build a community in which we can feel at home while simultaneously leaving space for the other. An urgent theme that now calls for attention and dialogue within our own modern and diverse societies. You can make a difference by getting this story told! Ariadne and Maartje have been friends since childhood, one is a trained documentary filmmaker, the other a researcher in conflict and peace studies. One is a ‘go-getter’, the other more of one an observing thinker. What started out as research on the conflicting identities of former child soldiers as both victims and perpetrators of violence, gradually resulted in this story. Our knowledge and experience in the fields of both documentary filmmaking and reconciliation processes enables us to create an exciting and comprehensible story, drawn from a complex reality. Maartje Wegdam (1982), director, photography, started working as director and camera woman for documentaries after graduating from Documentary Media Studies at The New School University (NYC). In 2014 she filmed for The Abominable Crime, awarded with the first Amnesty International Human Rights Prize at trinidad+tobago film festival (ttff). Maartje previously studied News and Information and International Relations at the University of Amsterdam (MSc) and worked as a camera journalist for Dutch public broadcasting corporations. Ariadne Asimakopoulos (1984), researcher, co-director, has a background in Conflict Studies and Human Rights (MA). In 2010 she conducted research in northern Uganda on reintegration and justice in the case of people like Opono, who are both victim and perpetrators of violence. Moreover, she works for Dutch peace organisation PAX for peace, where she advocates at an international level for the participation of young people in peace and security issues and coordinates projects that aim to involve young people in peacebuilding. Merel Notten (1969) studied scenario-writing and directing drama/documentary at the School of Arts in Utrecht, The Netherlands. Since 1993 she’s been working as a freelance editor in film and television. Her work as an editor includes drama tv series, documentaries and feature films. In 2005 she received a Golden Kalf nomination (Grand Prize in Dutch Film) for the editing of the feature film ‘0605’. In 2001 she decided to make way for her passion for music and combines her work as a film editor with studying composition and arranging at the Conservatory of Amsterdam, seeking to find a balance between the profession of filmmaking and music composing & arranging. Greetings to all! Just sorry for this message, I hope You will believe me, because I do not lie and do not earn this, I really need help. It so happened that I was in strong credits, I'm from Russia, in June examination of the daughter, and I have no money at all, I'm working, but all the money spent on loans. Remains at all much. Please help who than can, I really are in a very difficult situation. WebMoney: Z260768518606 Admin sorry if I violate the rules of the site. Many thanks to all. Fantastisch dat jullie aandacht besteden aan dit onderwerp! Heel veel succes met het (af)maken van de film. Succes met jullie prachtig zinvolle project! Geweldig jullie zijn er!! Fantastisch nieuws! Heel veel succes! De eindstreep is in zicht! Vanavond was ik bij jullie presentatie bij het Nederlands Film Festival. Door jullie persoonlijke presentatie wilde ik een bijdrage aan deze film leveren. Misschien zijn deze voormalige kindsoldaten door andere oorlogen vergeten, maar jullie brengen ze weer in beeld. Veel succes met het filmen en editen. Succes schatjes, ben heel benieuwd! Kussen uit Florence, Kinanya. Peace of Minds Academy 2015 ! Heel veel succes met het filmproces...!!! Jullie verdienen het om 100% (of meer) te halen! Succes, hoop dat het gaat lukken! Ok de laatste loodjes, succes nog deze dagen! Deze documentaire moet er komen, succes! 298 supporters have contributed to this project!